Chief Minister Chandrababu is engaged in the task of creating a functional role for special status practice. 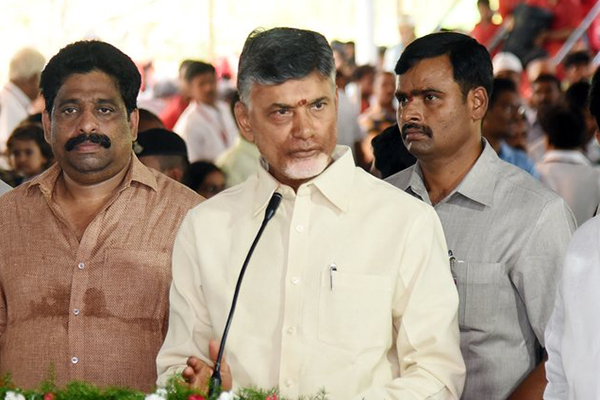 Chandrababu will meet with party spokesperson on Tuesday afternoon.Participation in the status quo Intellectuals,All parties have decided to conduct all-party meetings with districts.Party leaders have been advised to organize bicycle tours by constituencies. CM praised the fight against TDP MPs in Delhi.At the national level the struggle of the MPs has attracted everyone's attention.He said he would take a bus trip to the state within two to three days.The Center has been angry with Chandrababu, who are accused of corruption and murder politics in the state politics, conspiracy against the TDP.Treachery,Chandrababu, who told him to turn the politics of conspiracy.Told the party leaders.As Soon after the establishment of canteens across the state,He said the decision to give unemployment allowance.On July 11 Jyotirao Phule,Ambedkar Jayanti on 14th,On December 20, Chandrababu decided that the Dalit activities should be done at a large scale.